Since today is Clean Your Refrigerator Day (yep, there's a day for sparkling-clean appliances! ), why not give your favorite food-storage unit some TLC? It's easier to eat healthy once you have a clean, odor-free space with fresh strawberries, carrots, and broccoli front-and-center. Your refrigerator sees a lot of action. Chances are good that youâve got splatters of leftover meat, expired dairy products, and slimy vegetables lurking in the crisper. Since today is Clean Your Fridge Day (yep, there's a day for sparkling-clean appliances! ), why not give your favorite food-storage unit some TLC? Â It's easier to eat healthy once you have a clean, odor-free space with fresh strawberries, carrots, and broccoli front-and-center. Usually, this happens before a big trip to the supermarket. If you plan on going away for the holidays, clean your fridge the day before you leave. Take the time to check your inventory and throw away the items that will go bad before you get back. Make sure to use ice packs and cold beverages to keep the food fresh. Throw away anything thatâs past its due date. How can you tell if something is worth saving? Check out our guide to whether your moldy food can be saved or not. Since sudden changes in temperature might crack your shelves and crisper drawers, let them reach room temperature before you wash them in the kitchen sink with warm water and plenty of dish soap. Then, taking a microfiber cloth or a non-scratch sponge, use all-purpose cleaner or vinegar to wipe down the inside of the fridge. You can use baking soda to deodorize, and help scrub out any stains. Donât forget the rubber seals, which are a hotspot for mold and germs; use a diluted bleach solution with a toothbrush if they need special attention. Once drawers are clean and dry, put them back in their proper slots in the fridge. Now it's time to put your items back into the fridge. The best place to keep your eggs fresh? Leave them in the carton and store in the coldest part of the refrigerator, which is in the back. Put your healthy food at eye level or in easy-to-see spots so you reach for them rather than less healthy options. Fruits and veggies do best in the crisper drawer, since it is designed to keep the moisture in to keep them fresh for longer. Avoid washing them, though, since too much water can send them into early decline (wash them just before you eat them). Meat should be wrapped up tightly and kept in your meat drawer or the lowest part of the fridge, because you don't want juices dripping down and contaminating the rest of your food. And when it comes to leftovers, make sure to reheat them on the stove or the microwave to kill any bacteria. Consider getting fridge bins to organize your food by recipe, or by type. For example, you can put all of your snacks into one bin and your leftovers in another. You can also label your shelves so that you can save time and energy by getting stuff in and out of your fridge faster. Keep in mind that hamburger and other ground meats can be frozen for up to 4 months, chicken for 9 months to a year, leftovers for around 2 months, and foods purchased frozen are safe to eat indefinitely. This is providing, of course, that you keep a steady temperature of 0 degrees Fahrenheit or lower in your fridge. 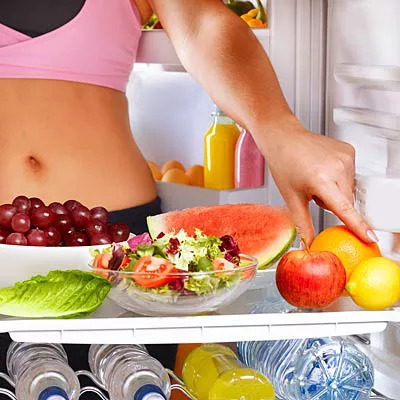 Since youâre apt to keep food in this compartment for longer periods of time, you may want to watch for improperly closed doors, power failure, and incorrect temperature settings. One simple way to check for changing temperatures is to put a ziploc bag or cup full of ice cubes in your freezer. If the ice melts, it will lose its shape when it refreezes, letting you know that your food has been compromised. You can also buy a gadget called the Freezcube Freezer Alert Frozen Food Safety Monitor ($19.99). It tracks the temperature in your freezer and lets you know if you need to throw out everything in your freezer. Place an open box of baking soda in your fridge and in your freezer to combat odors. You can also vacuum the coils in the back of your refrigerator to help it run more efficiently. For bonus points, locate and clean out the drip pan, which is usually at the bottom of the unit. Not all refrigerators have this, but if you do, youâll want to wash it out to make sure that the water doesnât overflow or collects odor-causing bacteria.